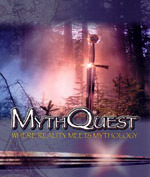 MythQuest is an hour-long family drama television series featuring two teen characters, Alex Bellows (Christopher Jacot) and his wheelchair-bound sister Cleo (Meredith Henderson). They have discovered a wondrous, heart-pounding secret that could unravel the cosmic struggle between good and evil, and, in doing so, reveal what it truly takes to be a hero. Like a magic looking glass, a computer screen becomes a gateway to the kingdom of myths: a gateway into which their own father, a celebrated archeologist, disappeared. Now on a quest to find him, Alex and Cleo must test their own heroism as they cross into a cyberworld of mythic imagination. Fantastic stories like the Greek Theseus And The Minotaur or the Egyptian Isis and Osiris, or the Aztec Quetzalcoatl are rendered with modern, state-of-the-art computer graphics and blended with contemporary characters in an episode format. A VIP and Minds Eye Entertainment co-production in association with TiMe Film Produktion and David Braun Productions, MythQuest is Executive Produced by Wolfram Tichy, Kevin DeWalt and David Braun. Producers are Knut Winkler, Ray Sager and Lienhard Wawrzyn.